A laughter-filled day with the family, a romantic seaside sunset, dinner under the stars… a lodge holiday at Nodes Point provides the best memories. But imagine if that could be every day. As a lodge owner, you can escape the hubbub of your home life whenever you feel the need to unwind. From a quick, refreshing weekend to a restorative month-long getaway. Stroll to the nearby golden beach for fresh sea air and sunshine, or head to the Isle of Wight’s lively resorts for traditional seaside entertainment. Your new coastal sanctuary is waiting for you. The traditional fun of the seaside mixed with modern luxury lodge living – the perfect recipe for relaxation. The Isle of Wight’s lively resort towns, sun-baked beaches and lush countryside are at your door. 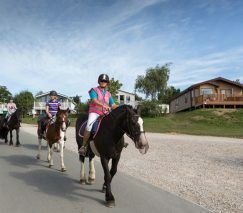 Paddle, build sandcastles and even horse ride at nearby Priory Bay Beach. New adventures await the little ones at the sports courts, playground and heated indoor pool. Modern conveniences and distinctive fittings make your new lodge-style home extra cosy.